Perhaps the biggest reason why more centre consoles are not sold is the partner will not give buying permission for a boat without a toilet. 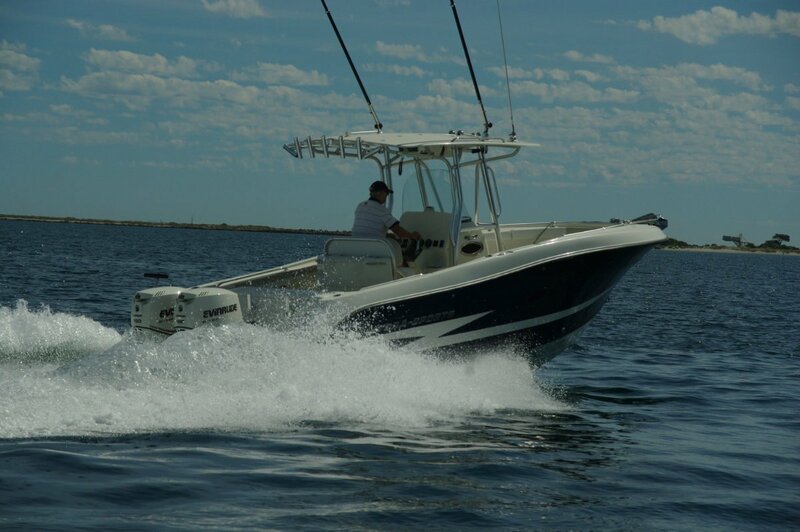 That reason is a non starter with the Hydra-Sports 2500CC: its console houses an electric-flushing toilet and lays on full standing headroom. It is so large a compartment that three batteries and the switchgear live in there as well and there is excellent access to the rear of the electronics. 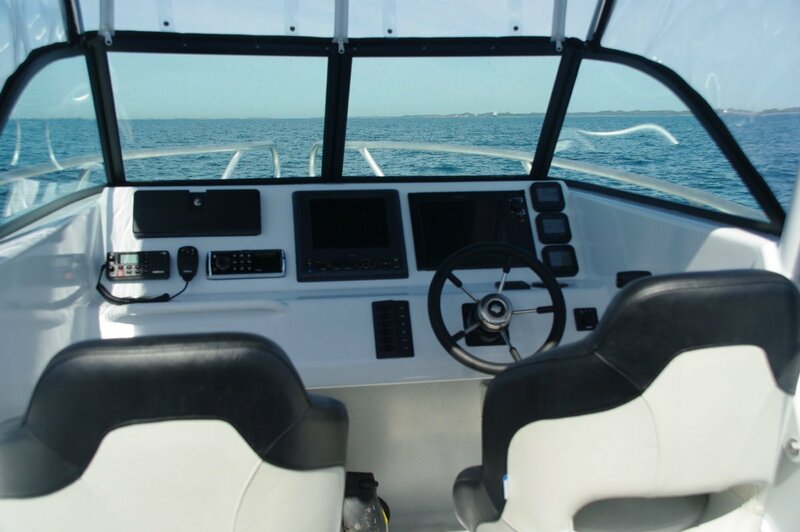 Obviously the boat itself needs to be big to take such a console, and the 2500 at 7.6m by 2.7m is one of the more sizeable centre consoles. This size is used well for the benefit of the dedicated fisherman. 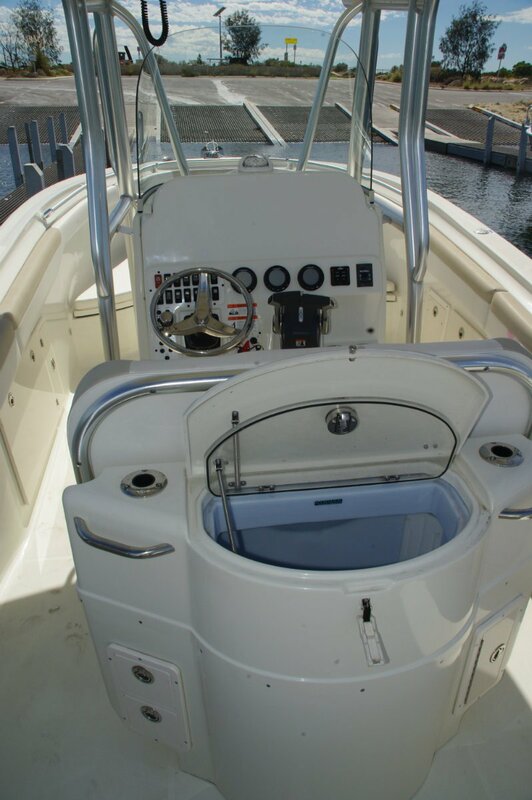 Despite the big console there is no impediment to easy passage all around the boat’s perimeter. The coamings are satisfyingly high with padding all the way, and instead of pockets within the bulwarks for the most part there are lockers, hopper style rather than hinged, with specialised applications: rubbish, tackle and so on. There are also rod racks and, beneath them all, space for fishermen to tuck toes. There are rod sockets elsewhere, equipped with rubber linings, giving a total capacity to suit a boatload of rod fetishists. The live bait capacity is equally impressive. 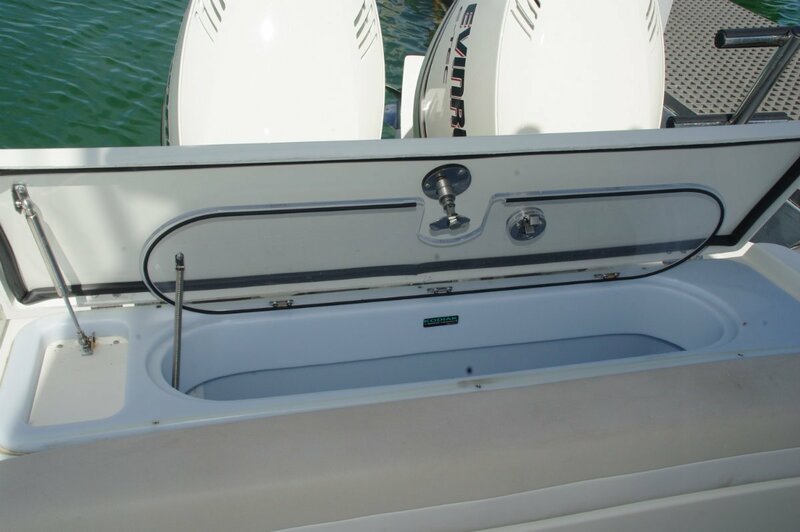 Behind the driving seat is another console housing a deep recirculating tank together with mini lockers and drawers, and at the transom yet another tank. The 2500 has a near infinity of places to put things with lockers and drawers inserted wherever there is spare room. The big volume items are the insulated fish boxes, and a pair of wet or dry lockers beneath the casting platform. 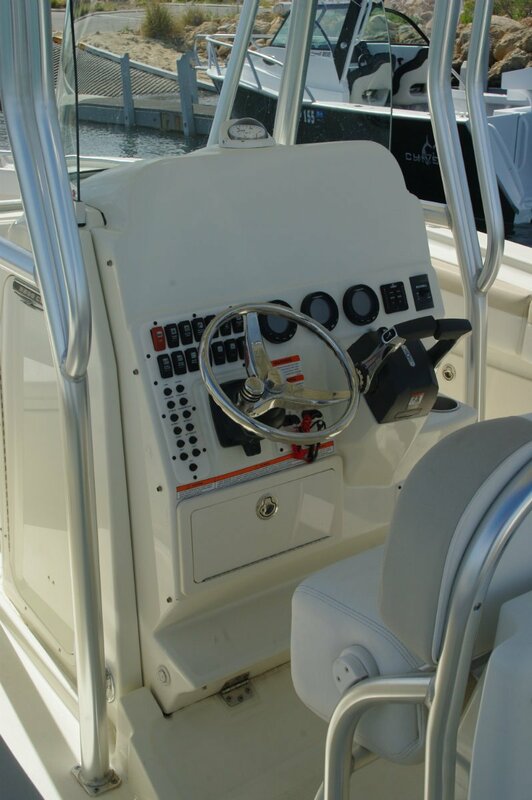 A fishing party is unlikely to exceed half a dozen, and there are good seats for this many: a double at the helm, a triple folding settee at the transom and a single at the console’s front. At the bow the casting platform is equipped with cushions to give casual seating for more. The T-top (in fibreglass) has a generous area – enough for the occupants of the three console seats and for a bunch of standing shade seekers. The T-top’s supporting structure is in large section pipe, elegantly welded, and features enough incidental and purposely provided grips for any number of hands. The comfortable driver’s seat is teamed with a moulded footrest that matches it very well. For reasons I do not understand, that is often not the case in centre consoles. It faces a tidily laid out dash that has a lot of surface area left clear for fitting a couple of plotter screens. The area in use has an impressive number of switches, which is not surprising considering the large number of lights – all LEDs – on board and the other electricity consuming items. One of these is the windlass locally fitted to this imported boat. 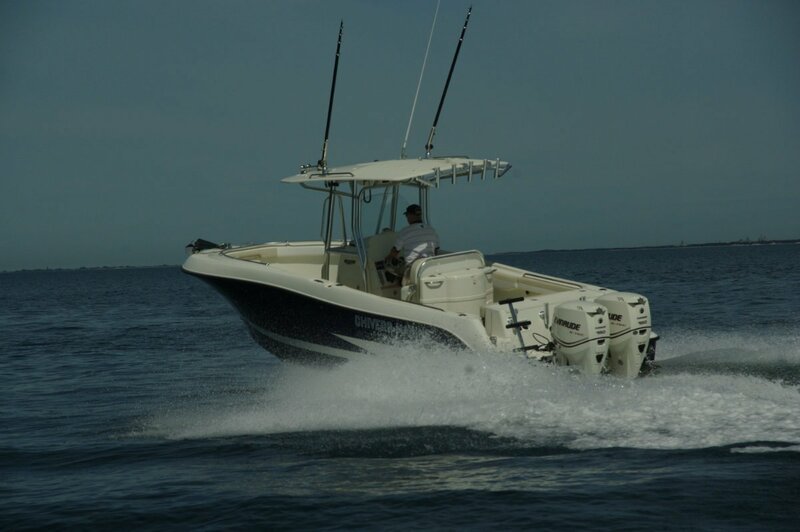 The 2500 is rated to take up to a pair of 250hp outboards. They would deliver a claimed top speed of 54 knots, which is more than anyone would want in west coast waters – or most other places, probably. 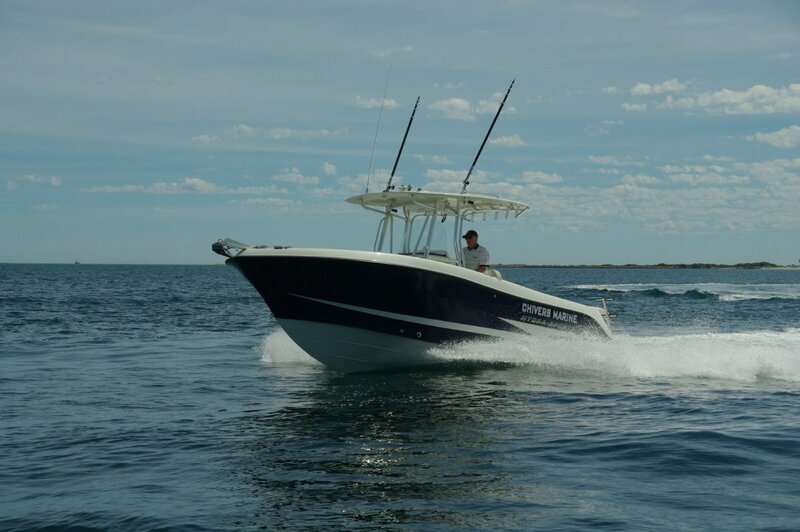 The motors fitted, twin 150hp Evinrude ETECs, delivered high 30s and felt a good match with the hull. It is a shapely hull with the respectable deadrise of 23 degrees. A sharp bottom alone does not necessarily guarantee a good ride, but on the evidence of the day the 2500’s designers have got it all together. The conditions were far from rough, but we used what lumps we could find, coupled them with speed, and experienced a smooth riding and quiet hull. We borrowed extra weight to simulate a fishing party; four mixed middle and heavyweights at one rail created only minimal list. 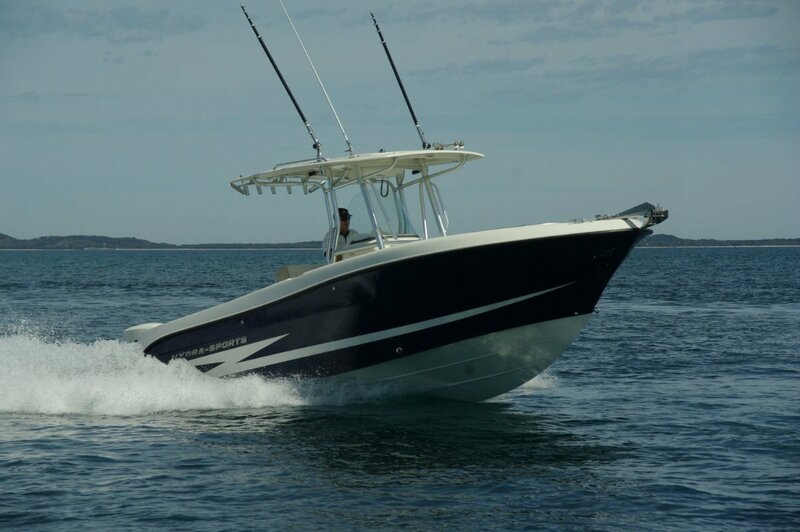 A well equipped, dedicated fishing boat with an attractive finish.